For more information about this Proven Safety Countermeasure, review the FHWA's Safety Effectiveness of Intersection Left- and Right Turn Lanes report. 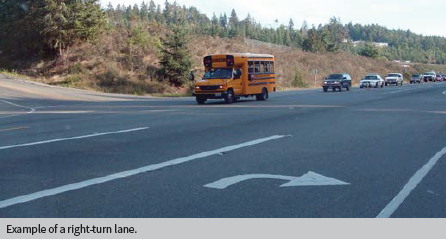 Auxiliary turn lanes—either for left turns or right turns—provide physical separation between turning traffic that is slowing or stopped and adjacent through traffic at approaches to intersections. Turn lanes can be designed to provide for deceleration prior to a turn, as well as for storage of vehicles that are stopped and waiting for the opportunity to complete a turn. 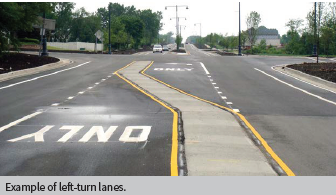 While turn lanes provide measurable safety and operational benefits at many types of intersections, they are particularly helpful at two-way stop-controlled intersections. Crashes occurring at these intersections are often related to turning maneuvers. Since the major route traffic is free flowing and typically travels at higher speeds, crashes that do occur are often severe. The main crash types include collisions of vehicles turning left across opposing through traffic and rear-end collisions of vehicles turning left or right with other vehicles following closely behind. Turn lanes reduce the potential for these types of crashes. Installing left-turn lanes and/or right-turn lanes should be considered for the major road approaches for improving safety at both three- and four-leg intersections with two-way stop control on the minor road, where significant turning volumes exist, or where there is a history of turn-related crashes. Pedestrian and bicyclist safety and convenience should also be considered when adding turn lanes at an intersection.